A few days before Christmas in 1988, I was driving south from Scotland heading down to London for an exhibition at the Design Council. I had left Kirkcaldy at the end of the afternoon surgery but had been held up on the Forth Bridge which was undergoing yet another unsuccessful attempt at resurfacing the carriageway – and as a result, it was just approaching 7pm when I pulled into the service station at Hillend to fill the car up for the long drive ahead. As I resumed my journey, the Archer’s theme tune started up and I put a cassette of John Martyn’s Solid Air on instead. The drive through the Scottish Borders from Edinburgh is a glorious one. Following the south side of the Pentlands the A702 passes through some delightful countryside and villages with stunning views in every direction. Passing through Biggar you gain the main motorway south – the M74 at Abington – and this is the quickest route. I often branch off at West Linton and take the 701 down to Moffat and it is one of Scotland’s best drives – up to the head of the Tweed valley and over the Devil’s Beeftub then down the head of the Annan to Moffat and the motorway. That would be my preference on most days, but the weather that particular evening was not conducive to a jaunt across the high moors; heavy sleet showers pushed on by a stiff south-westerly lashed the windscreen on the Saab as I rounded the hill just up from the Hillend ski slope, so the car was pointed at Biggar and an hour later I was driving up the slip road to the M74 at Abington and had just set the cruise control, when I was met with another line of stationary traffic – and this one wasn’t moving. The exhibition was the following day and I had a room booked in London that evening and had estimated an arrival time of between 11pm and midnight. That now looked improbable. A few minutes later, when I switched the radio back on, it became impossible. At approximately the same time as I was filling the car with petrol on the outskirts of Edinburgh, a small explosive device in a Toshiba Cassette recorder detonated in the hold of a Pan Am 747 airliner at 31,000 feet above Lockerbie about 70 miles to the southwest. The rest, as you know, is history. We were escorted south many hours later, skirting the crash site well to the west of the village and it was later in the day when I first saw the pictures on the television that the enormity of the incident finally became apparent. The sight of the enormous engine, embedded into the tarmac road and the houses ablaze with kerosene will remain with everyone who was around at the time and the worsening weather just added to the gloom and despair. Over the following years, I followed reports of the disaster as much as I could. My generation had not experienced anything like this before and the mere concept of international terrorism affecting a small Scottish village was an anathema; an explanation or understanding was certainly needed. But the police investigation and subsequent trial in Holland almost twelve years later raised just as many questions as answers with obvious and perplexing contradictions in almost every aspect of the case. The Trial was held in Camp Zeist – an American Air Base in the Netherlands – but under Scottish legal jurisdiction. It was, in essence, the High Court sitting in Holland – and the entire proceedings were broadcast live on television. It was compulsive viewing and fascinating to watch how the trial unfolded and what logical processes are followed to establish the verdict. I was struck how familiar it appeared. One aspect of my own day job is arriving at a diagnosis when a patient presents with a problem. Sometimes it’s fairly straightforward and the diagnosis is perfectly obvious, but occasionally it is more complicated than that and in these cases, you follow a logical methodology until you can make an accurate determination. Individuals who have suffered severe trauma and have undergone reconstructive or salvage surgery, may present in later years with conditions that have occurred as a result of either the trauma or surgery or both. Sometimes I am asked to determine which is more likely – no doubt to determine whether there is an exploitable liability for the referring agency – and you have to go through a process to get an answer. This involves taking a detailed history and conducting a comprehensive clinical examination then considering the evidence in context of the presenting complaint. Part of the evidence may be subjective – some objective. The clinical examination – or gathering of objective evidence – may include the use of investigative methods like X-Rays and Magnetic Imaging (MRI) or a pathology report – but once you have gathered all the material you are usually in a position to make an informed decision based on all the available evidence. If the evidence is inconclusive you may have to consider alternative or differential diagnoses then apply the evidence base to each to determine which is more probable. It’s good fun and makes the job something of a cross between Inspector Clouseau and Antiques Roadshow at times, which can never be a bad thing. With some patients however, the process takes much longer. Occasionally someone may come in with a symptomatic condition – pain in a joint or a tendonitis, but you are unable to determine a cause. These conditions are referred to as idiopathic. However, over time, sometimes years, that individual may present with a variety of symptoms or conditions that appear to be unrelated and in themselves may not prove anything or lead you to a diagnosis, but gradually you may see a pattern building and when you bring the evidence together at the appropriate time you very often arrive at a conclusion that with hindsight, often explains many other symptoms and conditions that patient has displayed over the years that you may not have been aware. Advances in medical technology helps. With the advent of MRI we now know of a condition called bone marrow oedema (or osteopenia), which was hitherto unknown. This usually occurs on post-menopausal women and very often it is one of the bones in the foot that is affected and it can be quite debilitating for several months. We weren’t able to make a diagnosis until this type of imaging became available – it was just ‘idiopathic bone pain’. The point of this is that the methodology used in arriving at a medical diagnosis is usually fairly robust and I could see similarities with the criminal process that was being televised every day from Holland. The available evidence is tested and examined and considered in the overall context of the charges before the court until a verdict – or diagnosis – can be reached by the Judge or the Jury. In the legal process – we already know what the diagnosis will be – either guilty or not guilty – and in Scotland, there is a third – not proven. That is the context in which the evidence is presented, examined and tested. Of course it is all done with a great deal more pomp and ceremony than you would normally expect to find in my surgery and it can be quite confusing, especially the legal procedures and custom. Often the most important piece of evidence is something you thought inconsequential, which on its own may seem evidentially weak. But a skilled advocate will have identified the importance of that particular piece of evidence in relation to the others and when they pull it all together in their closing arguments, they hope it makes a strong enough case to convince the Judge. Lawyers call it the “cable analogy” – where single strands of wire that, individually, may be quite weak – but when pulled together make something very strong. It is the same methodology as we use when reaching a conclusive diagnosis in patients with complex and developing conditions. However, there are some glaringly inherent weaknesses in court procedure that, thankfully, do not encumber clinical practice. For example, the only evidence the Prosecution will table is evidence that supports their case. The principal objective being to achieve a conviction, which is not quite the same thing as solving the crime – or reaching a conclusive diagnosis. Very often, it is the subjective evidence that sways the day – the powerful closing speech or a particular inference or conjecture during the examination of a witness – rather than objective evidence, such as forensic tests and corroboration. 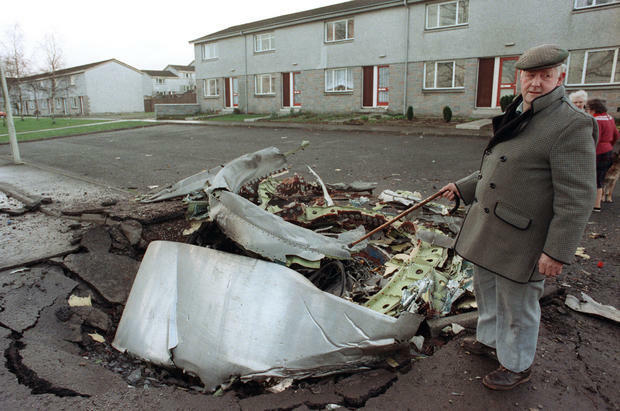 The Lockerbie Trial was largely speculative and circumstantial. To the layman watching the live broadcast, a guilty verdict for either of the accused seemed highly improbable. One of the most important pieces of evidence – a tiny fragment of an electronic circuit board used in timers for detonating explosives – was recovered from a remote hill-side and was identified to have come from a Swiss electronics company owned by someone who had previously sold timing devices to the Libyans. It was a plausible argument, but to me seemed highly unlikely given the atrocious weather conditions that night and the vast area wreckage was scattered over. But anything is possible when you don’t know the truth. This is neither a commentary about the Lockerbie Trial nor an opinion about the veracity of criminal procedure. It is simply an observation that something many of us witnessed has not yet been adequately and properly explained. Dr Jim Swire, who lost his daughter, Flora, in the disaster, sums it up perfectly when he said recently. “Our governments are not telling us the truth.” Being a medical practitioner, I assume he used his own methodology to reach that conclusion and I can see no reason to disagree. He is probably the most authoritative and knowledgeable voice on the case and yet remains convinced that the verdict is one of the worst miscarriages of justice ever to blight the Scottish legal system. With Megrahi’s death almost four years ago, the prospect of an posthumous appeal against conviction and sentence seemed unlikely but Jim Swire and other relatives of the victims pushed the Scottish Criminal Cases Review Commission to appeal the verdict. Last week, on the 5th November – a night when the sky is ablaze with explosions – the SCCRC finally decided, with all the sagacious sensitivity of the civil service, to drop the case – and now we will never really know what or who is responsible for the events that night. Three recent events reminded me of Lockerbie. The announcement by the SCCRC last week was one of them, but the other is a very touching documentary first shown on BBC Four three days earlier. It is about another man’s quest to find out the truth about what happened in the skies above Scotland that bleak December night. Ken Dorstein’s brother David was also on Pan Am 103 and he embarks on a remarkable journey to try and find the man responsible for his brother’s death. It’s worth a watch and you cannot feel anything but admiration for his determination, but I could not help but feel this was an attempt at revisionism as much as enlightenment. The other reminder was, sadly, the sight of another crashed airliner in a desert in Egypt – in circumstances eerily reminiscent to that we have just discussed. The sight of the twisted fuselage and enormous engines embedded into the charred ground, all too familiar. What chance of the truth being uncovered here? For me, Lockerbie and the likes of the Egyptian atrocity also illuminate another unsolved mystery – that of September 11th 2001 – where, even more curiously, the aircraft used in the Pentagon and Philadelphia incidents were deemed to have ‘vaporised’ on impact, leaving no traces of evidence behind. Having seen at first hand how robust jet engines are after falling from 31,000 feet into a tarmac road, I find that explanation highly implausible. And when you consider that a tiny fragment of an electronic circuit board could withstand a powerful explosion – and the inclement weather of a Scottish winter – sufficiently enough to be identified and used in evidence, how does a six-tonne Rolls Royce Turbofan jet engine simply disappear into thin air? One day, we may reach a conclusive diagnosis for all these events and others. But only if we change the methodology of the investigation. This entry was posted in Random, Unfinished Business by admin. Bookmark the permalink.